Je ne suis pas intervenu plus tôt sur l’assassinat du ministre libanais Pierre Gemayel, le 21 novembre, pour deux raisons. La première est que ce blog ne « réagit » pas à chaud à chaque événement et n’a pas pour but de donner « rapidement » une interprétation (J’ai donné des éléments pour comprendre le contexte libanais dans d’autres textes de ce blog) ; d’autre part, l’ensemble des médias a immédiatement désigné avant toute enquête le coupable, la Syrie, et le simple fait de s’interroger là-dessus peut apparaître suspect. Qu’on soit clair. Je ne sais pas qui a tué Pierre Gemayel. Cet assassinat a peut-être été commis sur ordre des autorités syriennes, ou à l’initiative de tel ou tel de ses services secrets. Mais, pour l’instant, personne n’en a apporté la preuve. Je pense en revanche intéressant de s’interroger sur certaines des « preuves » contre Damas et aussi, à partir de ce tragique événement, sur le contexte libanais. Le premier argument est connu. A qui profite le crime ? Selon ses accusateurs, le régime syrien craint la mise en place du tribunal international chargé de juger les assassins de Rafic Hariri (ce qui est probable) ; mais en quoi l’assassinat de Pierre Gemayel règle-t-il ce problème ? Dès le 25 novembre, le gouvernement libanais (en l’absence des ministres du Hezbollah et d’Amal, démissionnaires) a adopté le projet de tribunal international. De plus, il était évident que Damas serait désigné comme « responsable » de ce crime par les Etats-Unis et la France et que cela ne pourrait que renforcer le front antisyrien, au moment même où Damas multiplie les gestes d’ouverture en direction de l’Occident. Cette position sur le tribunal vient d’être réaffirmée avec force par un communiqué commune du 24 novembre de Nabih Berri, le président du parlement libanais et chef du parti Amal et par Nasrallah, le secrétaire général du Hezbollah (je le publie en anglais plus bas). Ammar al-Musawi, membre du bureau politique du Hezbollah, a déclaré sur Al-Jazira, le 24 novembre :« Il est clair que les forces du 14 février (Said Hariri et ses alliés) tentent de présenter le tribunal comme un sujet de discorde entre les Libanais. Je veux rappeler que, durant les négociations entre les différents dirigeants libanais, ceux-ci ont tous approuvé le tribunal international. Mais les gens en place tentent de nous empêcher de discuter le projet de résolution sur le tribunal (transmis par les Nations unies) (...) Nous discutons aussi avec les forces du 14 février de la création d’un gouvernement d’union nationale et de l’obtention d’une minorité de blocage d’un tiers. » Car la vraie question que pose l’opposition est celle-ci : le pays peut-il être dirigé contre la moitié au moins de sa population ? Peut-on présenter la situation aussi schématiquement ? En oubliant, par exemple, le général Michel Aoun, l’opposant le plus déterminé à Damas depuis quinze ans, qui dirige le principal parti maronite et qui est allié au Hezbollah ? O Lebanese, the recent escalation of the debate on the stand on the international tribunal and the exploitation attempts by many quarters to peddle specific political stands, has made it necessary to address you to state the truth as it is from the premise of our national and political constants and our principles, which are based on justice and truth. Immediately after the major crime of the assassination of Martyr Prime Minister Rafiq al-Hariri and his comrades that has afflicted Lebanon, the Amal Movement and Hezbollah affirmed and announced their eagerness to work to expose this crime and those who planned and carried it out, and to punish them, given that this is a national priority that must be attained. While we were daily reiterating our commitment to fulfil all the requirements for the establishment of an international tribunal, the crime of assassination of Martyr Deputy Jubran Tuwayni took place. The issue of expanding the investigation and the establishment of an international tribunal was listed on the agenda of an extraordinary cabinet session without giving the ministers the opportunity to discuss and prepare themselves for the issue to make it easier to be adopted. But the prime minister at the time insisted on not changing the date of the session and did not give the ministers two days to pr ! epare and discuss the issue. Had the prime minister agreed to do this, it would have been [long] enough to reach the necessary conclusions and the ministers of Amal and Hezbollah would not have suspended their participation in the government because their role in the preparation, participation and adoption of the decision has been ignored. Since the leaders of the two parties are eager to establish the tribunal and seek the truth, they kept reaffirming their support for the tribunal on every occasion until the national dialogue conference convened on 2 March 2006. The conference convened at the invitation of Speaker Nabih Birri. The first item on its agenda emphasized the need to unravel the truth about the assassination of Prime Minister Rafiq al-Hariri and its ramifications. Since the Amal Movement and Hezbollah have been constantly supporting the truth, they explicitly stated at the first session of the national dialogue that they support an international tribunal. Unanimous agreement on this item was reached in the first hour after the conference convened. Those attending paid tribute to the advanced stands of Speaker Birri and Hasan Nasrallah - stands that have been registered in the records of the conference. Since they insist on not having their stand on the tribunal be misconstrued, the leaders of the movement and the party grasped every opportunity during central celebrations and through Speaker Birri and His Eminence Al-Sayyid Nasrallah from the time when the national dialogue conference was held until the recent consultation meeting to reaffirm their decisive stand on this issue while the parliamentary majority was trying for political reasons to cover up some of their crises by making the people believe that any political change or stand on the government or its performance stems from the rejection of the tribunal. This showed that the facts on political issues that are related to the Israeli war on Lebanon and the economic, social and financial crises had been distorted in a manner that caused controversies. This weakened the unity that used to exist on the need to unravel the truth ; did not serve the cause of the tribunal ; and created some confusion among the people although the movement and the party kept reiterating their stand on the issue. O Lebanese : In view of the developments that prevailed in the Lebanese arena at the end of the Israeli war of aggression on Lebanon, Speaker Birri took the initiative to send out invitations for a consultation meeting among the parties to the dialogue on the issue of the formation of a national unity government and a new election law and to prepare for what is needed on the economic and financial level. Since we were eager to remind people of our positive stand on the tribunal, the consultation meeting was an opportunity to expand the discussion to reiterate the stand on the tribunal. The conferees spent some time discussing the issue and the Amal Movement and Hezbollah reiterated their known stand on this issue in a frank and explicit manner at the first and second consultation sessions. A limited meeting took place during the third session when Deputy Sa’d al-Hariri joined a meeting that was being held on the sidelines of the sessions between Speaker Birri and Deputy Ali Hasan Khalil on one side and Deputy Muhammad Ra’d and Minister Muhammad Funaysh and Deputy Husayn al-Hajj al-Hasan on the other. Deputy Al-Hariri proposed to the conferees a formula based on reaching agreement on the principle of the establishment of an international tribunal, discussing the details related to this tribunal in side meetings among the three parties before submitting it to the cabinet to ensure its expeditious and unanimous adoption, and approving at the same time the formation of a national unity government in which the opposition forces will have more tha ! n one third of the portfolios, where effective participation will be ensured, and which will be the introduction to the discussion and settlement of controversial issues. Since we were eager to settle the issue of the tribunal, we made many contacts in the wake of this meeting that was held before the consultation session was suspended to expedite receiving the draft project on the tribunal to implement what was agreed upon. The reply came at 2200 [local time] on Friday night that preceded the last session of consultations and after Prime Minister Fu’ad al-Sanyurah had contacted Speaker Birri, who stressed to him not to set a date for the cabinet meeting on this issue before the meeting that was scheduled to be held on Saturday - that is, not before carrying out the implementation steps that were agreed upon during the limited meeting with Deputy Sa’d al-Hariri to facilitate the adoption of the draft resolution. This would give the ministers and the relevant committee the time to study the details of the draft project on the tribunal. But we were surprised to find out at the onset of the session the next day, Saturday, 11 Novem ! ber, that there was an intensive campaign depicting us as if we were ready to barter the international tribunal for political demands while no mention was made of what took place in the limited meeting that was initiated by Deputy Sa’d al-Hariri. Monday, 13 November 2006 was then set as a date for the next cabinet meeting without discussing this with anyone and without taking into consideration all the statements we made saying that we were ready to discuss the draft project with a positive attitude and open mind. This was accompanied by ending the political discussion on the basic provision that was listed on the cabinet agenda dealing with the formation of a national unity government because key leaders of the majority decided that this demand could not be discussed. O Lebanese : In view of the fact that the crime of assassination against Deputy and Minister Martyr Pierre al-Jumayyil is being exploited in order to continue defaming our stand on the international tribunal, we have related the above facts in order to emphasize our firm support for this tribunal in accordance with the mechanisms that safeguard constitutional procedures and secure the attainment of the aspired objective. We say this while we insist on our legitimate right to call for a genuine political participation and we will not submit to any blackmail to have us change our stand on this participation. The confrontation by the other side of our legitimate political demands by resorting to the international tribunal to confuse public opinion and compensate for its weakness certainly does not serve the cause of truth and justice. Therefore, all of this will not dissuade us from committing ourselves before the Lebanese people to continue our call and have reco ! urse to the available democratic means within the laws and regulations in force. We will be compelled to use these means if the other side remains intransigent and flouts the pillars of Lebanese national accord. We ask God to stand witness to what we say. Pour ceux qui comme moi ne se satisfont pas des discours convenus et des problématiques sans issus, quelques aspects permettant une approche dépassionnée. Syrie–Liban : intégration régionale ou dilution ? "Les forces du 14 février" sont ceux qui ont pris position contre la Syrie, le jour de la mort de R. Hariri. Le camp "du 14 mars" (« qui fait référence à la manifestation géante après la mort de Hariri »), représente les forces du 14 février plus les partisans du general Aoun, ce que se garde bien de préciser le journaliste de Libération, et pour cause : comme indiqué par A. Gresh, le General Aoun anti-Syrien s’est depuis rallié au Hezbollah "pro-syrien". D’ou le refus des gens du Hezbollah et de Aoun lui meme de désigner les "anti-Syriens" (pourquoi pas pro-Americains ? la réponse est évidente) autrement que par la premiere appelation. « Les forces du 14 mars, qui contrôlent les deux tiers de l’Assemblée et le poste de Premier ministre, sont soutenues par Paris et Washington, qui voient, dans leur victoire électorale du printemps 2005, qui a suivi le retrait syrien du Liban, un triomphe de la démocratie. » La encore, dans son simplisme outrancier ou plutot sa mauvaise foi, ce journaliste oublie de décrire les "subtilités" libanaises des alliances électorales. Ce camp (du 14 fevrier donc) n’aurait pu obtenir la majorité sans l’appui des.... Chiites du Hezbollah et de Amal qui avaient fait alliance avec Joumblatt et Hariri, et doivent s’en mordre les doigts maintenant. Malgré ce contexte défavorable, le camp du General Aoun s’est quand meme assuré 21 siéges, ce qui fait du general, comme le fait remarquer A.Gresh, le principal dirigeant Maronite. Nul doute que si l’alliance Hezbollah/Aoun s’était faite avant ces élections, la majorité aurait été toute autre. Mais il n’est pas sur que Paris et Washington y aurait vu un triomphe de la démocratie. Enfin le systeme électoral libanais n’est pas exactement démocratique, puisque obéissant au sacro-saint "respect des équilibres communautaires". Faut-il pleurer avec Gershon Baskin ? Désolé, je ne peux pas. Je sais que David Grossman a, dernièrement, relancé avec succès la machine à jérémiades, mais ce n’est pas une raison pour embrayer. Assez pleuré après avoir tiré ! Cela fait des années qu’un bonhomme comme Gideon Lévy rend compte de ses rencontres avec ceux qu’Israël a besoin d’écraser. Gershon Baskin n’aurait-il pas lu Haaretz pendant tout ce temps ? Et puis cette manie du paradis perdu sioniste. « Quand sommes-nous devenus aveugles aux souffrances des autres ? » : parce qu’il y a un avant où éclatait le souci sioniste de l’autre ? Les sionistes « de gauche » se paient la tête des autres. Il serait temps qu’on leur ôte leurs masques à simagrées au lieu de pleurer avec eux. Aux dernières nouvelles, Gilad Shalit est toujours vivant. Ce n’est pas le cas des morts de Beit Hanoun. Je ne jette, disant cela, pas la pierre à Noam Shalit. Mais je n’ai aucune pitié pour Gershon Baskin. Comme disait l’autre, improvisant sur du Chateaubriand : « Il faut économiser les coups de pied au cul étant donné le nombre de nécessiteux ». Voilà un nécessiteux. Il se tient, mercredi prochain à Bruxelles, une manifestation en faveur de la libération de Shalit et des deux autres soldats. Après avoir essayé la force (combien de morts, encore ? ), on va essayer l’Europe. Je n’imagine pas que les manifestants demanderont la libération des 10.000 prisonniers palestiniens, ni plus sobrement encore, celle des 3.000.000 d’otages Palestiniens. Je pense que le Liban est malheureusement au centre d’intérêts et d’enjeux internationaux qui le dépassent et dépassent son peuple avide de liberté et de démocratie ! Avoir pour voisin Israël est la pire des choses ! On en revient tout frais-tout ravigoré, prêt pour le coup de pied au c... à Gershon Baskin. Liban - La saga des Gemayel : la Phalange - Stefano Chiarini, il manifesto, 24 novembre 2006. De l’assassinat de Gemayel à la crise libanaise. A qui profite le crime ? « Naturellement, la décision d’établir une cour spéciale pour étudier les assassinats de Hariri et Gemayel sont des obstacles sérieux [a un rapprochement entre la Syrie et les Etats-Unis]. Cette assertion de Landis me semble on ne peut plus pertinente, surtout si l’on épouse une autre récente assertion, celle du célèbre William Pfaff qui affirme que Bush vit maintenant hors de la réalité (Bush left reality behind). Si on ajoute la déclaration du professeur Rabinovich, on peut penser qu’il est dans l’intéret Busho-israélien de mettre hors-jeu toute tentative de rapprochement Syro-Americain. Et cet assassinat vient a point nommé. Une sorte d’“initiative”. 57% souhaitent que leur gouvernement entame des discussions avec les Syriens, et 59% redoutent une nouvelle guerre « au Nord » si de telles discussions n’étaient pas engagées. Il est vrai que 54% refusent l’idée d’un retrait du Golan. Mais il ne faut pas trop demander d’un coup. "La perspective de combats dans la grande périphérie de N’Djamena n’est pas à exclure dans les prochaines vingt-quatre heures", a indiqué l’ambassade de France qui a demandé aux ressortissants français de la capitale de ne pas quitter leur domicile dès la tombée de la nuit. Les autorités tchadiennes craignent une attaque de la capitale similaire à celle d’avril dernier, qui avait fait des centaines de morts. Dans un communiqué publié dimanche, le gouvernement tchadien a qualifié les opérations rebelles des dernières quarante-huit heures d’"opération de grande envergure tendant à le déstabiliser". Il a accusé comme à l’habitude le Soudan et, pour la première fois, l’Arabie saoudite d’en être les principaux inspirateurs. Le Soudan et l’Arabie saoudite "équipent, entraînent les mercenaires, et leur assurent la logistique nécessaire pour attaquer aujourd’hui le Tchad sur plusieurs fronts à l’est", a affirmé le porte-parole du gouvernement, Hourmadji Moussa Doumgor. "La guerre imposée aujourd’hui au Tchad relève d’une guerre pour la promotion de l’islamisme militant prônée par Al-Qaida de Ben Laden, qui n’épargnera aucun pays de la sous-région", a-t-il ajouté." Mr monsieur Gresh, je croix que vous n’avez pas conduit le raisonnement jusqu’au bout, parceque la meme question pourrait etre dirigée contre Israel, et beneficier de la meme analyse que pour le cas de la Syrie, autrement dit, si la reponse est par l’affirmative, Israel serait le seul beneficiaire du crime. • En ce qui concerne Bush, si c’est le commanditaire, il ne le ferait que dans l’interet d’Israel bien entendu, enfoncer la Syrie, ennemi potentiel. • La France n’a pas les memes motivations que Bush (affinité avec les chretiens Maronites)et n’irait jusqu’au crime. • Pour l’Iran et le HIZB, le meme raisonnement concernant le cas Syrien, pourrait leur etre appliqué. Il ne reste donc plus qu’Israel, le seul coupable à qui profite bel et bien ce crime. • créer les conditions adequates pour une confrontation confessionnelle, Guerre civile au Liban, qui conduirait ineluctablement à un partage de l’etat, et création d’une entité chretienne Maronite pro-israel au sud, dans le but de securiser la frontiere nord d’Israel. • Stigmatiser l’interventionnisme de la Syrie, et y favoriser une invasion Américaine. • Exacerber la diabolisation de l’Iran, comme etat terroriste, et amplifier la pression au sujet de son programme nucleaire. Se sont exactement les consequences de cet assassinat, comme d’ailleurs celui de Hariri. [...]israel a été déjà impliquée dans plusieurs assassinats visant à discréditer certains régimes, par exemple, dans les années 50, israel a fait assassiner plusieurs ressortissants britanniques en egypte, pour discréditer le gouvernement égyptien aux yeux des occidentaux, la découverte du fait que les assassinats ont été commis par israel (qui n’a pas hésité à assassiner des ressortissants britanniques alors que la Grande Bretagne était l’alliée d’israel, dans le seul but de salir la réputation de l’Egypte), entraîna la démission de david ben gourion en 1963, cette affaire fut connue sous le nom de "l’affaire Lavon". Le MOSSAD n’hesite pas à assassiner meme des juifs pour diverses raisons, créer la phobie de l’antisemitisme, et encourager l’Aleya. Voir en ligne : Pourquoi Pierre Gemayel, pourquoi maintenant ? • l’Irak (le gouvernement) qui ne veut pas être démantelée ! Irak : Une guerre civile pour se partager le pays, par Giuliana Sgrena. "Le premier argument est connu. A qui profite le crime ?" C’est moins qu’un argument, et il n’y a rien de plus éloigné d’une enquête objective que celle qui commencerait par cette méthode ! Tout d’abord, que doit-on appeler "profiter" ? Ah oui, évidemment, dans le cas du casse d’une banque, ou quand le mari infidèle tente d’éliminer sa génante épouse, il paraît facile de répondre à cette question, mais en politique, et notamment lorsuqe l’instabilité est la règle ? Posons-nous la même question à propos des attentats terroristes du 11/09/2001 : a qui profita le crime ? Au coupable désigné ? De ce fait, poser la question du "profit tiré du crime" est une plaisanterie. Bert, ce n’est pas parce que c’est difficile qu’il faut que vous baissiez les bras. Allons, courage ! Pierre Gemayel n’était cependant pas un homme de pouvoir puisqu’on avait surtout parlé de lui il y a deux ans quand, en soutenant la « supériorité génétique » des chrétiens libanais, il argumenta que ceux-ci exprimaient « la qualité » contre la « quantité » des musulmans"
La démocratie version 2006 n’est plus celle qui respecte les lois et les droits de l’homme inscrit dans les constitutions, mais c’est bien le ralliement ou non à Washington. Le Hizbollah et Michel Aoun demandent le respect de la constitution du pays, ils représentent un danger pour la paix, pour leur peuple. Le pion Saad Hariri et son clan de démocrates version 2006 Walid Jumblat qui court aux état-unis voir Condolisa Rice tout deux unis par les liens d’une politique américano-saoudienne , eux, devraient représenter les sauveurs du Liban libre. les nations arabo-musulmanes ont érigé en religion d’état le meurtre de citoyens ; même Arafat la Limace n’a pas été assassiné par le mossad, alors les déblatérations de Ahmed Saint-Yves sont malvenues. "Bert, ce n’est pas parce que c’est difficile qu’il faut que vous baissiez les bras. Allons, courage !" Je ne suis pas enquêteur, ni politique ! Mes bras n’ont aucune utilité en l’espèce ! Le mot "difficile" n’est pas opportun, pas plus que le mot "profite" dans "à qui profite le crime". J’évoquais par exemple l’assassinat de Kennedy : Pensez-vous connaître un jour la vérité ? Et relativement aux attentats du 11/09, pensez-vous qu’il y aura un jour ce qui permet de croire à l’état de droit, à savoir une enquête indépendante, des conclusions policières aboutissant à des inculpations sur des bases rendues publiques, puis un éventuel procès si les mis en cause peuvent être appréhendés ? Et concernant Hariri, ou Gemayel ? Le reste n’est que spéculation, communication, procès d’intentions...mais cela n’a rien d’objectif. Il ne s’agit pas de céder devant la difficulté, mais de constater le renoncement de ceux qui sont censés défendre "la justice" aux rêgles mêmes de ladite justice. Dans ce cas, simple constat, nous ne connaitrons que la vérité des vainqueurs, de ceux qui auront le dernier mot. Vous avez raison Bert, mais il se peut que quelques familles Syriennes préfèrent quand même qu’on cherche à qui profite le crime, pour qu’on puisse déterminer à qui il ne profite pas et ne pas donner suite à l’appel au lynchage de Monsieur Geoges W. Bush, président des États-Unis d’Amérique. Mais peut-être que vous n’appartenez pas à une famille syrienne Bert ? "Mais peut-être que vous n’appartenez pas à une famille syrienne Bert ?" "quelques familles Syriennes préfèrent quand même qu’on cherche à qui profite le crime, pour qu’on puisse déterminer à qui il ne profite pas et ne pas donner suite à l’appel au lynchage de Monsieur Geoges W. Bush, président des États-Unis d’Amérique." Je lis dans le dernier n° de "aviation week" : "Fears of nuclear-armed rogue states and global terrorism may be bad for international security, but the world’s most dangerous places have benefited one sector of the US economy : foreign military sales are set to hit a near-hit record this year"
A qui profite donc le crime ? 27 novembre 2006 10:22, 27 novembre 2006 12:22 représente une seule et meme personne bien sur, et toujours les memes crétineries et le meme récidivisme maladif. 33% des enfants de Sderot (ville Israélienne cible des "qassam" palestiniens) souffrent d’un désordre psychique appelé “stress post traumatique” selon le Haaretz. Et 100% des enfants palestiniens ajoute rageusement “Angryarab”. Olmert a entendu Grossman : il propose aux Palestiniens de s’engager "dans une nouvelle voie". Il est prêt à leur faire "des offres très généreuses". Il est prêt à se "retirer de nombreux territoires en échange de la paix avec les Palestiniens". C’est Grossman qui doit être content : la Gauche comme le Droite, voici "les offres les plus généreuses" d’Olmert. "Nous avons commencé avant-hier", ajoute Olmert, guilleret. Je n’ai rien vu, hormis la mort de combattants palestiniens ce W.E. encore et celle d’une femme palestinienne - mais qu’est-ce qu’elle avait, celle-là, à traîner comme ça, dehors ? Il y avait déjà eu les "offres les plus généreuses" de Barak. Qu’en ont fait les Palestiniens ? Rien. Bah, ces Palestiniens ne savent jamais saisir le bien qu’on leur jette. Des manchots. Des ingrats, je vous dis. Tous des manchots et des ingrats. 1% c’est déjà 1% de trop , quel que soit le camp . Mais est-on obligé de prendre parti ? Que pensez-vous des déclarations d’Ehoud Olmert ? Nuage de fumée ? Déclaration sincère ? Grosse blague pour faire rire à une Bahr’Mitzvah ? Le très bien informé blog Loubnan ya Loubnan souvent cité ici évoque un danger imminent qui n’apparaît pas dans vos analyses : la forte pression pour une partition du Liban, afin d’affaiblir les composantes qui "ne plaisent pas" à l’occident et israel, et préfigurer sans doute ce qu’il adviendrait du moyen orient abandonné sous leur coupe. Qu’en pensez-vous ? Le texte d’Avnery, dont parle K, vient d’être traduit en français : Une soirée à Jounieh, sur le site de l’Association France-Palestine Solidarité. « Que des chrétiens et des musulmans de dix-sept communautés différentes aient su y partager le pouvoir pendant des décennies ... » Robert Solé (sur le Liban bien sur). C’était dans la rubrique Images d’Epinal. Plus réaliste : La guerre civile aura t-elle lieu ? Je reconnais avoir rode sur ce site plusieurs jours a l’affut d’une analyse a chaud d’Alain Gresh. Il est tout a votre honneur, Monsieur Gresh, de ne pas vous livrer a des speculations intempestives. En plus de tous les points que vous avez deja releve ci-dessus, plusieurs negligences sont frappantes dans le traitement de cette affaire dans les medias. Nullepart ils ne mentionnent les recentes declarations indignees de Pierre Gemayel, qui deplorait que les refugies chretiens du Chouf (1983) n’etaient toujours pas indemnises tandis que le gouvernement Sanioura cherchait a concurrencer le Hezbollah dans la course a la renconstruction et au dedommagement des victimes de la guerre de juillet. Ceci est une attaque frontale envers son allie de circonstance Walid Joumblatt, aui aurait quelques comptes a rendre quant a l’attribution des fonds qui lui ont ete confies pour l’indemnisation des populations deplacees. Le front du 14 mars pourrait bien etre moins unis que ce que les medias occidentaux refletent. De meme, il est connu que le pouvoir Syrien s’appuie sur des services de securite affiliees a des pouvoirs parfois opposes. Les accusations de l’ancien vice-president Syrien Abdel Halim Khaddam a l’encontre du pouvoir de Damas quant a son implication directe dans l’assassinat de Rafic Al-Hariri, ont ete presentees copmme credible dans la presse. Sa campagnem,depuis sa residence Parisienne, pour un changement de regime a Damas a mis l’Elysee dans l’embarras puisqu’elle rendait evidente le detournement de l’affaire a des fins politiques. Il est bien possible que des responsables Syriens soient a l’origine du meurtre de Gemayel, mais il serait etonnant qu’ils appartiennent au clan deu president Bashar Al-Assad, dont le regime etait en train de se refaire une sante sur la scene internationale notamment grace a ses allies locaux au Liban et a leurs partenaires. Il eut ete peu opportun de leur mettre des batons dans les roues alors qu’ils semblaient en position d’ebranler le gouvernement pro-Americain de Fo’ad Al-Sanioura. En revanche, Khaddam qui a mise sur la chute du regime aurait bien interet a maintenir l’isolement de Damas. Malgre cela, toutes les analyses que j’ai lues a ce jour mettent en causes "la Syrie" ou "les Syriens", depeints comme une entite homogene. En reponse a la contribution de Monsieur Bert, la question "a qui profite le crime ?" vise a identifier les suspects potentiels et leurs mobiles afin de determiner quelles pistes sont les plus credibles. Des indices peuvent ensuite renforcer une piste ou une autre. En l’absence de preuves formelles dans l’immediat cette approche est parfaitement judicieuse. « 1% c’est déjà 1% de trop , quel que soit le camp . Mais est-on obligé de prendre parti ? ». Mais non tj, il ne s’agit pas de nier les souffrance des enfants israéliens, mais de dénoncer le fait de considérer les palestiniens de moins de 12 ans non pas comme des enfants mais comme des terroristes. En fait, s’il est vrai que la “religion” Druze est dérivée du Chiisme, il est important de faire 2 remarques : elle n’est pas plus “extrémiste” que n’importe quelle autre religion au Liban ; et à part d’en etre un dérivé historique elle ne ressemble en rien au Chiisme ni d’ailleurs au Sunnisme. Le passage : « La loyauté envers la communauté passe avant toute autre loyauté - et certainement avant toute loyauté envers le Liban. » ne peut etre compris sans un autre plus loin : « C’est lui [le chef de la communauté] qui distribue tous les postes « appartenant » à sa communauté. » C’est ce qu’exprimait G.Corm : "Je compare souvent le système communautaire à un système totalitaire. Chaque communauté exerce un totalitarisme sur ses sujets. Ce système est usé mais continue parce qu’il est tout le temps alimenté par le système régional et les influences extérieures sur le Liban." Sans remettre en cause les informations souvent pertinentes et les articles en général plutôt bienvenus de Robert Fisk, on peut tout de même mettre un bémol au titre que vous lui décernez (’un des meilleurs spécialistes du pays’). Robert Fisk a tout de même répété à pusieurs reprises que c’est le Hezbollah qui a provoqué la guerre avec Israël (’le Hezbollah a provoqué la guerre en capturant deux soldats israéliens et en en tuant trois autres, le 12 juillet’ dit-il) . C’est au minimum un sacré raccourci, et éventuellement un mensonge. S’en tenir à cette présentation des faits sans développer est en tout cas peu acceptable de la part d’un ’spécialiste’. Pourquoi ne pas présenter la chose autrement et dire que la capture de soldats israëliens a été l’excuse choisie par Israël pour déclencher une guerre qui était de toute façon planifiée de longue date ? Si on doit se focaliser sur les prisonniers, pourquoi ne pas parler de tous les civils, militaires et politiques faits prisonniers par Israël depuis des années ? Tout ça pour dire que certaines déclarations de Robert Fisk sont un peu courtes pour un ’spécialiste’. J. Cook l’a bien montré ici et la. D’autre part la communauté Libanaise est elle meme egalement « répartie dans le monde entier ». En réaction aux commentaires de Jean, les “Forces Libanaises” de Geagea, de par leur extrémisme, sont les plus enclins a oeuvrer en faveur de cette partition. Il est a craindre que, si jamais cette partition se réalise, une guerre intra-communautaire se déclare au sein de la communauté Chrétienne, du fait de la représentativité trés minoritaire du parti de Geagea au sein de cette communauté. Comme d’ailleurs peut etre des guerres intra-communautaires au sein d’autres communautés. Cette partition ne me semble pas du tout pouvoir assurer la paix civile. Exusez moi Mr Grsh de revenir sur l’affaire du LOBBY . D.B. : Bon, deux autres exemples, plus contemporains, du pouvoir de l’AIPAC sur le contrôle de la politique depuis les coulisses et sur la scène. J.B. : Essentiellement ce que Clinton a compris, tout comme Bush le jeune – l’actuel George Bush – c’est que si vous ne pouvez pas vous battre contre eux, alors il faut les rejoindre. Il y a eu un article dans le quotidien juif israélien "Ha’aretz" qui décrivait la judaïsation du Département d’Etat. Ce que vous avez vu dans l’administration Clinton a été une bataille des sionistes libéraux pour soutenir Israël, à l’intérieur de l’administration contre les supporters extrême droite du Likoud à l’extérieur de l’administration. Ainsi, vous aviez tout un débat autour de ce qu’allait être la politique américaine, partagée être entre ces deux groupes. Dennis Ross est maintenant avec l’AIPAC. Martin Indyk, qui a créé "l’Institut de Washington pour la Politique au Proche-Orient", vitrine de choix de l’AIPAC, est entré dans l’administration grâce à Clinton et s’est vu dans la foulée accorder la citoyenneté : il est Australien d’origine. Ainsi, vous voyez leurs allées et venues. Note de Jeff Blankfort : Pour ceux qui ont peut-être espéré que ce nouveau lobby pro-israélien allait fondamentalement différer du bon vieil AIPAC, cet article devrait mettre un terme à leur illusion. Ils apprendront d’ailleurs ici même qu’un ancien membre ultra-sioniste du Congrès US, Mel Levine, en est un des initiateurs. Il semble bien que cette « nouvelle » opération ne soit qu’une entourloupe des sionistes libéraux, afin d’enterrer la controverse et le débat autour du pouvoir et de l’influence du lobby israélien, soulevés par l’analyse des professeurs Mearsheimer et Walt, par le professeur Tony Judt, ainsi que, tout récemment, par James Petras, dans son nouveau livre Le Pouvoir d’Israël aux USA (The Power of Israel in the United States). Merci Saintyve pour ces précisions, concernant, l’influence lobby pro-israélien aux USA. Mais rassurez-vous, je n’ai aucun doute sur son existence. Mes doutes portent sur le sens qu’il faut donner au mot "influence". A force de vouloir tout expliquer par cette influence, on risque de passer à côté de certaines réalités. La publicité de l’action de ce lobby focalise l’attention, sur son rôle. Mais certains de ses membres peuvent plus discrètement, utilisent le lobby à des fins personnelles (Geoge Soros par ex.). L’administration US ne se prive pas non plus pour rejeter sur le lobby la responsabilité d’actions controversées (refus des choix démocratiques du peuple palestinien par ex.). Je ne doute pas non plus que le lobby pro-israélien joue un rôle dans le réchauffement de la planète, mais je ne suis pas sûr que ce rôle soit significatif. Je ne pense pas que la politique que mènent les US depuis le renversement du Shah, soit dictée par le seul lobby pro-isralélien, ou alors, il aurait remplacé le "lobby pro-iranien". Et même si les US étaient totalement influencés par le lobby "pro-israélien", encore faudrait-il préciser de quels israléliens il serait le représentant, ou alors il faudrait le renommer en lobby "pro-israéliens", car la société isralélienne n’est pas monolithique. Peut-être que certains israléliens ont intérêt à la mort de Pierre Gemayel, mais pas Israel. Parce que l’argument qui consiste à l’expliquer par une volonté de déstabiliser un pays déjà déstabilisé n’est pas recevable. Je n’arrive pas à réconcilier les actions US sur le terrain, avec l’activité du lobby pro-israélien, par contre je les comprend très bien dans un contexte de guerre économique (et la ça tombe bien parce qu’en temps qu’européen je me sent particulièrement visé). Voici un point de vue lumineux, celui de Jonathan Cook. Un journaliste et écrivain basé à Nazareth, Israël. Son livre, “Blood and Religion : The Unmasking of the Jewish State ” a été publié par Pluto Press. La Syrie, un bouc émissaire commode pour la mort de Gémayel, par Jonathan Cook. Jonathan Cook à Nazareth, 24 novembre 2006. Après ces tires croisés il ne faut pas s’étonner que des balles aillent se perdre au Liban. si on se fie à "résistance.chiffonrouge", ce type vendrait père et mère, il est aussi peu juif que possible, n’hésite pas à ruiner les économies d’un pays. Autant dire que je n’en crois pas un mot, comment aurait-il pu s’allier à la famille Bronfman, qu’on ne peut accuser d’antisionisme primaire, bien au contraire ? A moins qu’il ne veuille les utiliser ? Traduction (partielle) du “communiqué commun du 24 novembre de Nabih Berri, le président du parlement libanais et chef du parti Amal et par Nasrallah, le secrétaire général du Hezbollah”, a partir du 8ieme paragraphe. On se rappelle qu’a l’instigation de Nabih Berri (président du parlement) un dialogue national s’était ouvert le 6 novembre. Plusieurs sessions ont eu lieu avant que le point de rupture ne soit atteint. « Une réunion limitée a eu lieu lors de la troisième session lorsque le député Saad Al-Hariri a joint une réunion [entre Chiites] qui se tenait en marge de la réunion. Le Député Al-Hariri [Saad, fils de feu Rafic] a proposé aux conférenciers une formule reposant sur le fait d’atteindre un accord quant au principe de l’établissement d’un tribunal international, et sur les détails liés à ce tribunal lors de réunions en coulisse entre les trois parties [Hezbollah, Amal, et Hariri] avant de le soumettre au cabinet [ministériel] pour assurer son adoption expéditive et unanime, et approuver en même temps la formation d’un gouvernement d’unité nationale dans lequel les forces d’opposition auront plus d’un tiers des postes de ministre, où une participation efficace sera assurée, et qui sera l’introduction à la discussion et au règlement des questions controversées. « Mais nous fumes étonné de découvrir au début de la session le jour suivant, samedi 11 Novembre, qu’il y avait une campagne intensive nous dépeignant comme étant prêts à donner notre accord sur le tribunal international contre des satisfactions politiques tandis qu’aucune mention n’était faite de ce qui avait eu lieu lors de la réunion limitée lancée a l’instigation du député Saad Al-Hariri. La date du Lundi 13 novembre 2006 a été alors fixée comme date de la prochaine réunion du cabinet ministériel sans discuter de ceci avec quiconque [sous entendu quiconque de l’opposition] et sans prendre en compte toutes nos déclarations disant que nous étions prêts à discuter du projet de résolution de manière positive et l’esprit ouvert. Faux, Saint-Yves. Cet article n’existe pas. une photo qui convaincra peut etre Mr Ayad, le journaliste de Libération, que les choses « ne sont pas ce qu’elles paraissent etre » au Liban : « La « guerre des portraits » empoisonne le climat à Achrafieh » (Achrafieh est le principal quartier Chrétien de Beyrouth, et les portraits en question sont ceux de Aoun et Geagea ). ....quelque 300 militaires ont dû intervenir pour empêcher militants des FL (Geagea) et du CPL (Aoun) d’en venir aux mains. • Aux Fans du blog Loubnan ya Loubnan : le Nidal nouveau est arrivé : toujours le meme gout. • Plus sérieusement, le trés fiable Ghassan Ben Gido, envoyé special d’Al Jazeera au Liban, vient d’annoncer que le début des manifestations du camp anti-Americain aura lieu dans les 72 heures. Espérons que l’armée Libanaise restera unie pour éviter le bain de sang. Al Jazeera rapporte que la majorité vient de prendre une initiative pour debloquer la situation. Lors d’une rencontre, Amine jemael a fait des propositions à Nabih Berri. Volonté de sortie de crise ou manouvres pour retarder les manifs ? L’avenir nous le dira. Mais peut etre que Landis est un Syrien déguisé en Américain ? Compassion. Celle du conseil des droits de l’homme de l’ONU qui vient de voter (45 voix pour/1 contre-Canada-) une résolution proposée par des pays musulmans : arret des implantations dans les territoires occupés, désarmement des colons, et démantèlement des colonies existantes. Elle a été qualifiée de résolution allant dans le sens d’une « perpétuation du conflit », par l’embassadeur Israelien a l’ONU. Qui a parlé de partition ? • Les sacrifices des dizaines de milliers de partisans et de sympathisants dont les souffrances et les douleurs [etc..]. bonjour monsieur gresh, le crif parle d’une livre sur votre journal et israel. l’avez vous lu ? qu’en pensez vous ? K merci pour la traduction, j’ai pas pu la lire in inglish. Pierre, l’influence du LOBBY dont il estquestion, est celle qui concerne le soutien inconditionnel à Israel, meme contre les interets US. et non pas de la politique exterieure US en général. C’est ainsi que le Département d’Etat qui a historiquement été considéré comme un ennemi par l’AIPAC, plus enclins à soutenir les états arabes et les intérêts pétroliers de l’Amérique – c’est assez intéressant – a été littéralement disculpé et un certain nombre de lobbyistes juifs libéraux, comme Dennis Ross, ont été introduits dans l’administration Clinton. BEYROUTH (AP) - Un militant islamiste syrien, qui tentait d’entrer illégalement au Liban, a déclenché mardi sa ceinture d’explosifs après une fusillade avec les forces de sécurité syriennes près de la frontière, faisant deux blessés, a annoncé le gouvernement syrien. Omar Abdullah, 28 ans, connu aussi sous le nom de code d’Omar Hamra, était l’un des chefs du groupe islamiste "Tawhid et Jihad". Alors qu’il tentait de franchir la frontière, côté syrien, au poste de Jdeidet Yabous avec de faux papiers, il a ouvert le feu sur les forces de sécurité syriennes, avant de tenter de prendre la fuite, selon le communiqué du ministère syrien de l’Intérieur." surtout, n’en parlez pas, ça risquerait de nous faire rire !! Saintyves, si l’action du lobby israélien "est celle qui concerne le soutien inconditionnel à Israel, meme contre les interets US" elle a toute la sympathie de l’européen que je suis. Comment fonctionne le lobby sioniste aux USA. 29 novembre 2006 a parlé de l’attentat-suicide en Syrie à 10:36. Devoir accompli, il a ri. J’en suis fort aise. Si 29 novembre 2006 10:36 éprouve le besoin de s’offrir un vrai rire qui soulage, un rire qui soulage vraiment, il peut toujours reposter en gras la formidable conclusion de son message. Puis rire de lui. Promis, je rirai aussi. Haaretz, 29/11/06 "Chirac : France, U.S. agree there is no point talking to Syria"
"The conditions for an honest dialogue with Syria do not exist." 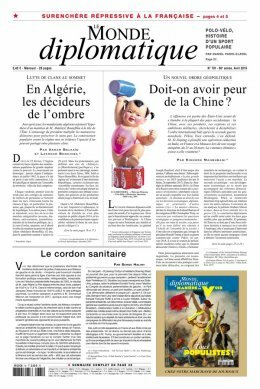 L’éditorial d’Ignacio Ramonet, Labyrinthe palestinien, dans le Monde diplomatique de décembre, fait froid dans le dos. "Vers l’abîme. On sent confusément que les souffrances subies par les Palestiniens, les solidarités de plus en plus audacieuses qu’un tel tourment entraîne au Proche-Orient, et les violentes réactions de défense d’Israël, risquent de conduire le monde vers l’abîme." Yann, Mr Chirac, habituellement si pragmatique, devient incroyablement va t-en guerre dés que les intérets de la famille Hariri sont en jeu. Mais le plus choquant est qu’il ait qualifié l’assassinat de Rafic Hariri de "crime contre l’humanité" au moment meme ou les Libanais etaient endeuillés aprés les massacres de centaines de civils par l’armée israelienne. Noam Shalit et la "compassion"
Gershon Baskin a dit « compassion » ? Alors peut-être faut-il relire Baskin en ayant à l’esprit ces mots de Noam Shalit. J’avais dit que je ne jetais pas la pierre à Noam Shalit. Aujourd’hui, c’est pure « compassion » si je ne le fais pas.